Sometimes it seems like picturebook writer extraordinaire Julia Donaldson and her rotating cast of illustrator collaborators must provide the source material for about 50 percent of all kids’ theatre. And why not? She offers tight, kinetic rhymes, a relentless cavalcade of memorable characters and gently subversive twists on classic kids’ stories. Illustrated by David Roberts, ‘The Flying Bath’ is one of Donaldson's lesser-known books, and feels a splash familiar in the telling (there are echoes of the more famous ‘Zog and the Flying Doctors’). But there’s real invention in this theatrical telling, for ages two to five. Instead of being about a trio of bath toys – a turtle, a frog and a duck – who come to magical life and zip about in the titular tub solving water-based emergencies, Samantha Lane’s production casts the entire thing as imaginative bathtime play between a fractious brother and sister (Elliot Pritchard and Phoebe Hyder). Accepting that their three ‘main’ toys (designed by Emma Tompkins) are suspiciously large and look suspiciously non-waterproof, it smartly avoids obvious puppets. Instead, a whole world of H2O-centred fun is conjured from the items strewn around the colourful set, as oddball characters are created from flannels, sponges and, er, a novelty baboon bog brush. 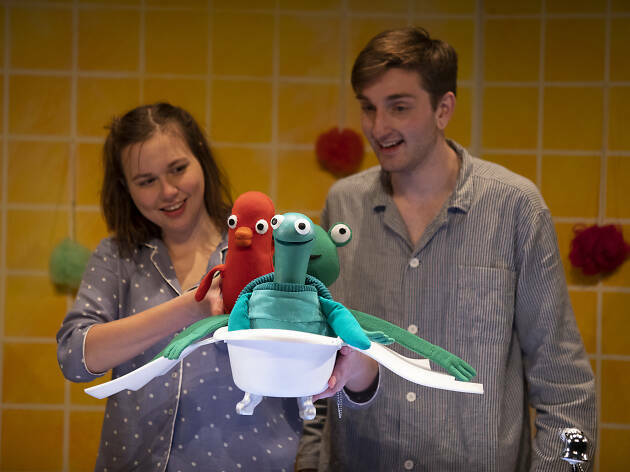 It’s a nice story that’s a better piece of theatre, a lovely tribute to the power of imaginative play, combined with relatable bathtime content for the wee ’uns.